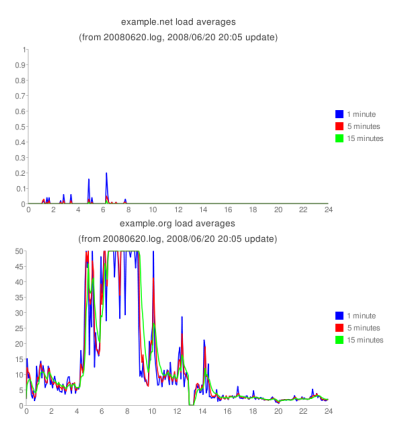 utgraph.py is a python script, it visualizes server's load averages from simple uptime result lines log file. And this script is a my study for pygooglechart and Google Chart API. Note: If you really need to use this script, I'll have to tell you a my opinion. Change your server. Porbably, it's better way than using this. You can download from http://wids.net/archive/utgraph/, and extract tar.gz. In the version 0.5, utgraph needs load average lines that the first char is blank (' '), but of course you can easily edit utgraph's parser. If you hope to view some hosts in one page, you may write simple html file, includes these hosts cur.png links. The cur.png files are always symbolic linked to newest image file when utgraph runs. After all, you hope to monitor more than 2 hosts, you should use the -d option. GNU General Public License 3. 'Why'? Because, the pygooglechart is licensed under the GPLv3. Q: Do you use this script? A: Of course, Yes. Oh my Dreamhost! !